This page goes over the basics of how Wholesale Gorilla works, and will walk you through creating and testing a wholesale discount rule on your shop. This is a great page to read if you’re just getting started, or if you are interested in how Wholesale Gorilla works. It’s all about the customer tags. In order for the prices on your store to change to wholesale, or to see any wholesale functionality such as order limits, the Quick Order form, etc, a tag on the customer account must match a customer tag you are using for a discount rule in Wholesale Gorilla. All wholesale customers will need an account: In order to be able to log into your store, wholesale customers will need an account for your shop. These accounts can be created through our sign up form, manually, or can be an existing customer account. We'll go over this in a lot more detail in the customer's section of our knowledge base. Open Wholesale Gorilla, and click on the Discounts tab. Here you will see a list of all active discounts for your store. On the upper right click Create Discount. Set a discount level. You can create a discount rule for your entire store, a specific collection, certain products, or even specific variants. For now let's keep it on entire store just so you can easily see how things work. 1. Select a discount level. Choose a customer tag. Here is where the magic happens. Any customers with this tag on their customer account will have this rule applied to prices whenever they are logged in to your store. For now let's set the tag to wholesale. Percent off: this will set the wholesale price to a % off the current retail price of the product. (not the compare-at-price). If you change the price of the item in Shopify, the wholesale price will be adjusted as well. Set Price: This will create a fixed wholesale price for the product. It won't change if you change the retail price of the product in Shopify. Set an Amount. The % or Currency in the amount input will change automatically based on the Discount Type. Just so we can easily see how things work on your store, enter $8.88 in the amount field. Next we will need to choose a customer account to receive this wholesale pricing. You can visit the customers section in our knowledge base for a detailed look at creating customers, but for now we'll keep things simple. You have two options for setting up a customer account: use an existing account or create a new one. In your Shopify admin click Customers (on the far left). Find the customer account you would like to use in your customers list and open it. In the far right column you will see a section called Tags. 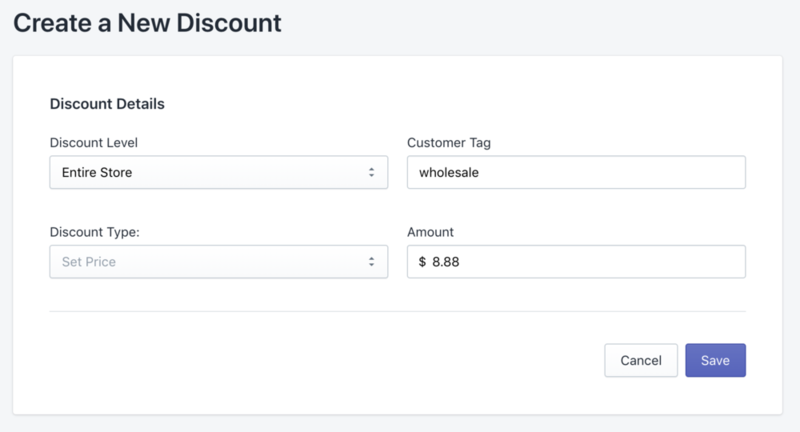 Here is where we'll add tags matching the discount rules we have created in Wholesale Gorilla. 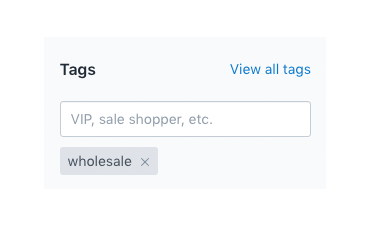 Our rule was set to use the tag wholesale, so add the tag wholesale to the tags field. Next go to the front end of your store as though you were a customer visiting your site. Login to your shop using this customer account. You are now logged in to your store as a wholesale customer. Enter all of your test account details. The most important fields are email, and at the very bottom the tags field. In the tags field we will need to add a tag that matches a discount rule in Wholesale Gorilla. The discount rule we created earlier was for the tag wholesale, so add the tag wholesale here. We will need to activate the customer account so you can login to your store. Under the customer account name will be a button called Send Account Invite. Click this and follow the on-screen instructions to send the invite email. Next open your email and click the link to activate the customer account on your store. After setting a password you will now be logged into your shop as a wholesale customer. Welcome to your wholesale store! You are now logged into your shop as a wholesale customer. On the account page you will see a link to the Quick Order Form. Only wholesale customers will see this link (customers with a tag on their account that matches at least one discount rule in Wholesale Gorilla). If you start to browse store, you will see that all prices are now $8.88. You can now shop your store as a wholesale customer, and checkout just as a retail customer would, except with wholesale prices. The only major difference you will see from your retail shop is on your cart page. When you click checkout our app will open a shipping address confirmation popup. The Shopify requires us to submit shipping information when processing a wholesale order, which is why we need to capture this information before the checkout page. These steps show you the minimum needed to get wholesale up and running on your shop. There are a ton of other features that you can take a deep dive into by going through our knowledge base. Next up we recommend checking out the Getting Started FAQ on this page for answers to some common questions people have when setting up. Then we recommend visiting the Customers section to get an understanding of the different ways customers can create wholesale accounts on your store. Keep an eye out for Learn More links. These will take you directly to the help page related to the section you’re viewing. This link will take you to valuable resources related to the section you’re viewing. As always don’t hesitate to reach out if you have any questions, we are here to help. Can I set discounts to be based on order quantity or amount? All discounts in Wholesale Gorillas are based on customer tags, and cannot be calculated based on order quantity or price. Can I have multiple pricing groups or multiple discounts per product? Yes, you can have as many different pricing groups as you like, and as many different discounts for each product as you need. If multiple discounts apply to a product for a certain customer, the lowest price will be used. Customers will only see the discounts associated with the tags on their account. What if I am running a wholesale only store, or the prices of my products are already wholesale prices? You will still need to tag customers so that our app knows who to run wholesale functions for. We recommend creating a rule that says: For customers tagged wholesale, the entire store is 0% off. This way the prices won't change, but we will know who is a wholesale customer. This can be useful to use alongside exclusion tags. How do wholesale customers pay for their orders? Our app doesn't store any credit card information or process payments for security reasons. All orders created by Wholesale Gorilla are sent back to Shopify for processing. Paid orders will be placed in the Orders tab of your Shopify admin. If you are using Net Checkout then the order will live in Drafts until it is paid or marked as paid by you. You can read more about Net Checkout here. The Shopify API we use does not allow us to apply discount codes to wholesale orders. This is an unfortunate limitation, but is not something we are able to get around until Shopify decides to change this policy.